A collaboration of six PHNs has responded to GPs’ wishes for greater support in managing the mental health care of their patients. As such, GPs practising in the SNPHN region now have access to a psychiatrist on the phone or via secure messaging. The service is free and available Monday to Friday, 9am-5pm. There is a simple one-off registration process – GPs can visit gpsupport.org.au or call 1800 16 17 18 to register. 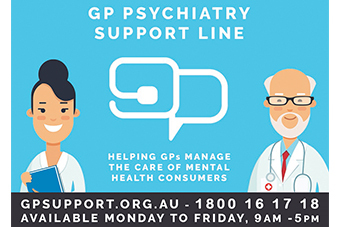 The Psychiatry Support Line for GPs is supported by joint funding from Central and Eastern Sydney PHN, COORDINARE – South Eastern NSW PHN, Hunter New England and Central Coast PHN, Murrumbidgee PHN, Northern Sydney PHN and Western NSW PHN through the Australian Government’s PHN Program. The service is exclusively for GPs practising in these PHN catchment areas.